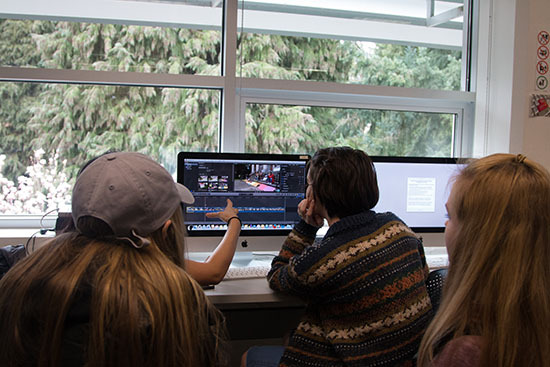 Students collaborate on multimedia projects in a Gateway to Media class at the University of Oregon. Photo courtesy of UO School of Journalism and Communication. Much has been said about the challenges that communication professionals have faced on their journey into the digital age. But in some ways, journalism educators have had it even harder. It’s one thing to learn to communicate via new media and platforms, but quite another to teach hundreds of students how to use all those tools — not to mention the many new technologies coming down the pike — on top of the fundamentals, like storytelling, grammar, ethics and accuracy. "Because today’s tool du jour might be obsolete by the time your students graduate, what they really need are the critical thinking skills." The UO J-School’s solution was to design a 12-credit, three-course sequence integrating previously separate courses in writing, information gathering and visual communication. 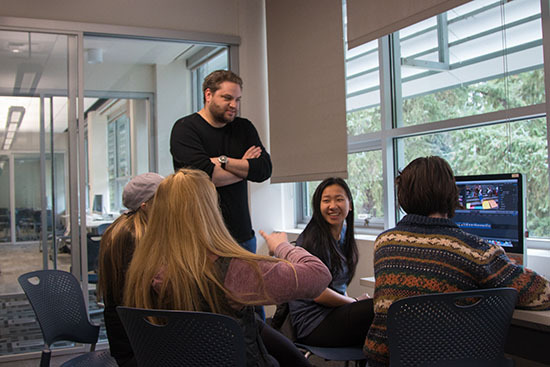 Students across all areas — journalism, advertising, public relations and media studies — start their major coursework in an intensive multimedia storytelling experience called Gateway to Media. It’s a digital storytelling boot camp that grounds them in foundational concepts, practices and skills before they advance to specialized tracks. This “gateway” approach addresses two goals: It teaches students enough to make educated decisions about what to specialize in later. And it gives them practice in telling a story in different ways, giving them versatility that’s invaluable once they hit the workplace. It’s a model many of the top J-schools — including UO, University of Wisconsin-Madison and University of Texas at Austin — now use. Want to start a digital journalism gateway course at your school? Here are seven tips from those who have led the way. 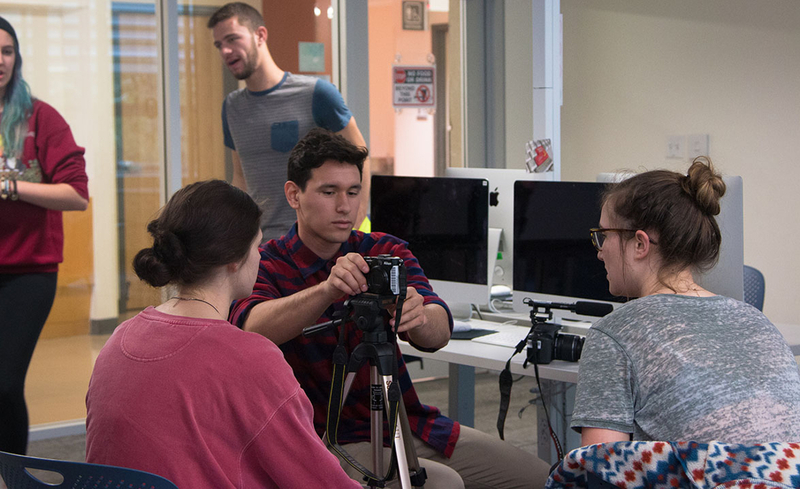 Whether students go on to be long-form journalists, documentarians, ad copywriters or a PR people, the number-one skill they will need is the ability to communicate a story in a way that engages both reason and emotions. That commonality offers a powerful focal point for a digital communication course. The list of platforms communicators must learn is long and constantly in flux — from video and podcasts to social media, mobile apps, interactive infographics and virtual reality. Yet technology is not the most important part of a digital skills boot camp. Video editing is a valuable skill for today’s journalists. But gaining digital agility — the ability to decide which media suit a given story and to learn new technologies on the fly — will serve students best in a constantly changing media environment. Photo courtesy of UO School of Journalism and Communication. Anyone who has held an internship knows that doing real work in the trenches offers invaluable experience no classroom assignment can match. That’s why the third course of UO’s Gateway sequence pairs student teams with local nonprofits for a real-world client experience that benefits students while building relationships in the community. While advertising, marketing and PR writers need a journalist’s grasp of a good story, journalists benefit from a strategic communicator’s understanding of market and audience. That’s why UO’s Gateway program and UW-Madison’s Mass Communications course require students from all majors to learn both journalistic and strategic storytelling. In addition to experience with digital communication tools and platforms, any media organization, agency or corporate communication department will expect new employees to walk in the door with collaboration skills. Because content is often produced in team environments, collaboration skills are just as important as communication skills. Photo courtesy of UO School of Journalism and Communication. Because different platforms engage different audiences, most agencies and media outlets want content producers to envision each topic using a variety of approaches. Your students’ education won’t end when they leave school. But as journalism educators, you can give them a good start with a toolbox of digital skills, critical and strategic thinking practice, and the confidence to keep trying new things. Andra Brichacek is a writer and editor working in the School of Journalism and Communication at the University of Oregon. She has 18 years’ experience creating content for print and online media and has specialized in education since 2008. Follow her on Twitter @andramere.